A passing suggestion, a joke even, but the seed had been planted. ‘Oh yeah’ crossing Pentland Firth sounds like a great idea …. haha but the tidal planning will never work out. The untouchable idea gradually came into focus. The more we researched and checked and checked again the clearer it became. This hair brained idea was going to be technically possible. The weather was perfect with a following wind, slack tide would give us a perfect opportunity to dart across the most treacherous stretch of the renowned Pentland Firth. Yep the same stretch that had punished us only the day before for being half an hour late to round (or not to round in our case) the tip of Stroma. The only thing that could possibly stop us from doing this adventure was us wussing out. All evening Jonny and I let out nervous giggles and passing glances at one another not committing to the plan until we woke up the next morning to see perfect conditions as predicted. We were determined and excited for a challenge. Ferry gliding across the first tidal channel to Stroma, we were happy that out calculations had work this time. Now for a tactical wait. Nervously watching the huge breakers off the rocks by the light house. Waiting is not something I do well, but knowing the only way to cross this next stretch of water was by using the half hour either side of slack, or risk getting a swift exit out to sea on the charging conveyer belt of tide was enough to hold me from dashing across. 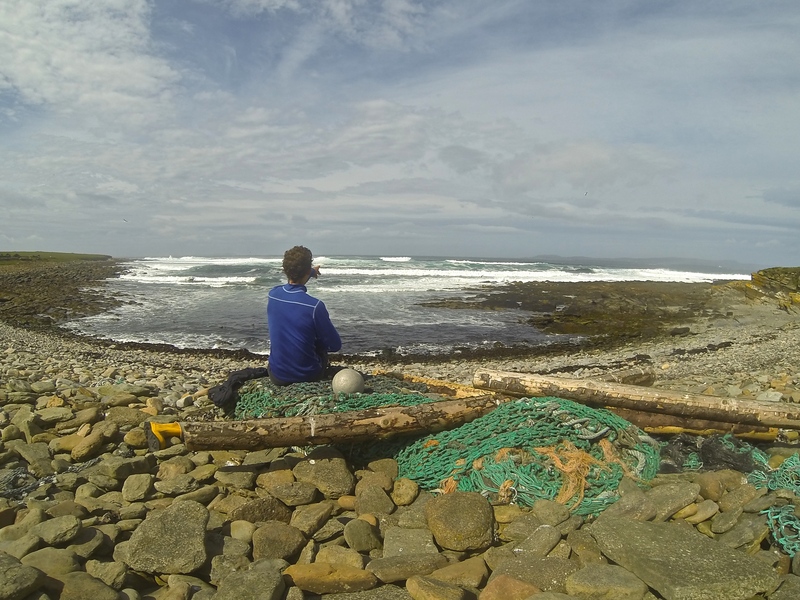 We explored the deserted houses on Stroma, feeling the uncomfortable sensation of abandonment all over the island especially the fishing boat siting at the top of the slip way, left to rust away. Finally the time came to get going. The unsettling sensation in my stomach and the continual ‘what ifs’ circulating my head suddenly got shifted to the side, all I could feel now was concentration for the crux of our journey. The swell built up gradually the further out we got, until the point when we looked back over our shoulder and we couldn’t even see sight of the land for the house sized swell lifting and dropping our tiny kayaks. Turning around was no longer an option even if we wanted to. This feeling of commitment is one that many extreme sports athletes must chase, each challenge one step beyond the last. I felt small. Really really small, the waves were not aggressive, not scary but their huge size was certainly unnerving. The closer we got to Swona the bigger the reef break ahead of us became. We were paddling fast ahead of schedule and the tide had not change yet but the currents were still pushing us steadily towards these frothing white breaks. Going with my gut instinct to change our angle against our calculated route paid off and with a uncomfortably dry mouth and huge relief, we paddled up into a tiny but shelter inlet called Haven Bay. We were two thirds of the way across and we now had a three hour wait before the tides were settled enough to allow us to cross the last section to Burwick. We walked across the island to watch the huge waves battering the NW edge of the Swona, from here we could get a clear view of why we were waiting. The confused water swirled and kicked up on nearly every edge of coastline, this can only be expected on an island right in the middle of a stretch of water that can easily reach nine knots in speed, but the swirls in the guide book seemed insignificant until looking at them in real life. The eddies meeting the currents produced crazy white capped stretches of water and I felt relieved to be sitting watching rather than out there right now paddling at this very moment. The waiting gave us some time to explore the Island of swona. There are many abandoned houses on the island just left by there previous owners. They have remained untouched for years and we couldn’t help but have a snoop around some of the cottages. The island had and eerie atmosphere, farms and houses just left to rot. I was feeling nervous about getting back on the water after watching its unsettled movements for the last three hours, but only 6 km stood between us and our finishing goal of Burwick. The closer the land got the more I enjoyed the choppy water. My belief in our plans and calculations was slowly being proven in front of my own eyes. A mistake outhere would be punished with more than just a long slog achy muscles. Drifting just a little too far would land us in a rather compromising reef or even worse out in the north sea. Rounding the Pier in Burwick, felt good. The relief and the sense of achievement was rewarding. 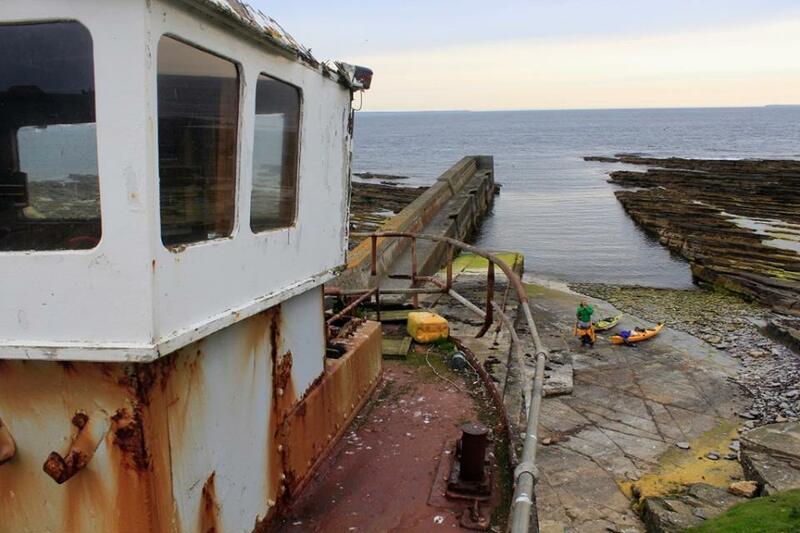 Our only worry now was whether this abandoned ferry terminal was going to deliver us a lift back to John o’Groats, or whether we would spend our evening camped out on the red plastic seating, planning our paddle back the next morning. After a celebratory dance when the ferry finally rocked up, a feeling of anti-climax began to sink in. It had all gone to plan, all that worry, nerves and excitement was over and we had achieve our goal. Yet I couldn’t help but feel like we hadn’t worked hard enough for it. No epics. No mistakes. Just smooth running. Thanks Jonny Hawkins for some super pics. Great Britain. 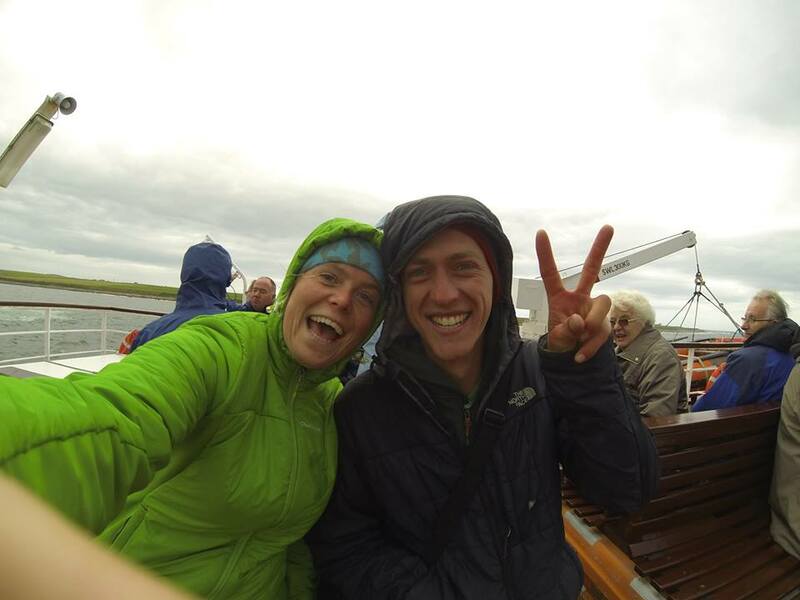 Erin fell in love with sea kayaking on Scotland’s west coast. 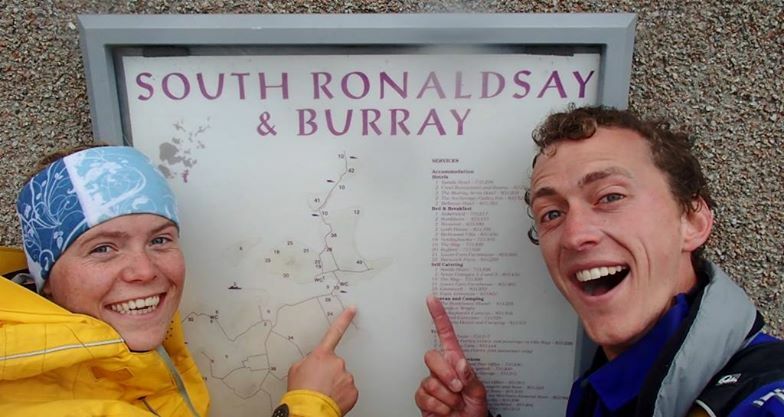 Countless islands to explore, with beaches of pristine white sand keep Erin coming back to the Scottish isles where she works as coach and guide with Wilderness Scotland. Since discovering that there’s no better travel companion than a kayak, she’s travelled far and wide, from the fjords of Norway and Patagonia to warmer climes of Sardinia and Corsica in the Mediterranean.